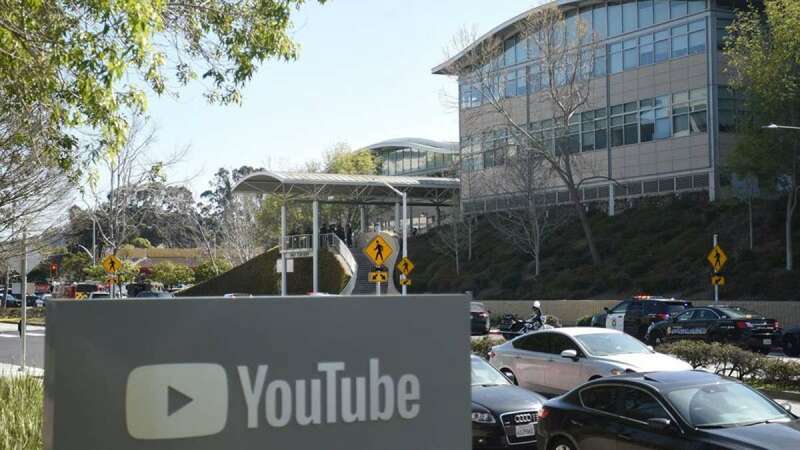 San Bruno : A woman with a handgun opened fire at YouTube's headquarters in the US state of California, shooting three people before killing herself, authorities said. The incident took place on Tuesday and the San Bruno Police Department identified the female attacker as 39-year-old Nasim Najafi Aghdam, a Californian resident of Iranian descent, the US media reported. The motivation for the shootings was under investigation, police said, although her social media postings included criticisms of YouTube. The violence began about 12.45 p.m. in a courtyard outside the company's headquarters, south of San Francisco. Witnesses described seeing a woman shooting a gun in the courtyard as others ran for their lives. Images broadcasted on local TV stations showed employees leaving with their hands raised. Several YouTube employees tweeted about the attack as it was taking place. Product manager Todd Sherman said people fled the building in panic as the shooting unfolded. Some ran while others hid when the gunshots rang out. Many were initially stunned. Some reported hearing fire alarms. Others said they thought the loud bangs they heard came from people moving equipment. Police found one gunshot victim near the entrance of the company headquarters, San Bruno Police Chief Ed Barberini said. Two injured women ran across the street and took shelter in a restaurant. A fourth person injured an ankle while fleeing but was not hurt by gunfire, officials said. The female attacker took her own life after the shootings. She was found at the scene and appeared to have killed herself with a handgun, said Barberini. The shooter was believed to have known at least one of the victims, two law enforcement officials told CNN. Aghdam was active on several social media outlets including YouTube, where she had channels in Farsi, Turkish and English. On YouTube, she published an eclectic set of videos, including music parodies and workouts, on topics like animal cruelty and vegan cooking. In February 2017, she recorded a video on Facebook criticizing YouTube for taking measures that decreased the number of views on her videos. Her father told a reporter for a CBS affiliate that his daughter had been missing for several days. He said he had warned police that she was angry with YouTube. YouTube terminated her account following the shooting. Her Instagram and Facebook accounts were also removed. YouTube spokesman Chris Dale praised the quick police response to the incident and said: "Our hearts go out to those who suffered in this attack." Twitter said it was horrified and was monitoring instances of misinformation. Google, the parent company of YouTube, said it was cooperating with law enforcement. Google CEO Sundar Pichai said he was "grateful to everyone inside and outside the company for the outpouring of support and best wishes". "I know a lot of you are in shock right now... Over the coming days, we will continue to provide support to help everyone in our Google family heal from this unimaginable tragedy," he said. After the incident, President Donald Trump praised the quick police response: "Our thoughts and prayers are with everybody involved. Thank you to our phenomenal law enforcement Officers and first responders."